HoloHolo Grill is about celebrating life’s pleasures. Designed with fun and good times in mind, we offer a leisurely island, away from life’s worries. We invite guests to cruise through their time with us, thinking not about the destination, but relishing in the journey. Relax and be ohana! We’ll bring the grinds and aloha spirit. Sign up today to receive VIP updates, special Holoholo Grill grand opening VIP access, and other great offers. The goal of this Web Site is to provide You with access to information about Our hotel chain’s facilities, services, products, and related links to meet Your needs (the “Content”). The Terms are meant to protect all of Our visitors to this Web Site, and Your access to and use of this Web Site signifies Your agreement with these Terms. DO NOT USE THIS WEB SITE IF YOU DO NOT AGREE WITH THESE TERMS. We reserve the right, in Our sole discretion, to modify, alter or otherwise update these Terms at any time. Such modifications, alterations, and updates shall be effective immediately upon posting. You agree to be bound by such modified, altered, and updated Terms if You access or use this Web Site after We have posted notice of such modifications, alterations or updates. We control and operate this Web Site. All Content on this Web Site, including, but not limited to, text, images, illustrations, audio clips, and video clips, is protected by copyrights, trademarks, service marks, and/or other intellectual property rights (which are governed by United States and worldwide copyright laws and treaty provisions, privacy and publicity laws, and communication regulations and statutes). The Content is owned and controlled by Us or Our affiliates, or by third party content providers, merchants, sponsors and licensors (collectively the “Providers”) that have licensed their content or the right to market their products and/or services to Us. Content on this Web Site or any Web site owned, operated, licensed or controlled by the Providers is solely for Your personal, non-commercial use. You agree to abide by all additional copyright notices, information, or restrictions contained in any Content. You may download a single copy of any Content contained on this Web Site, solely for Your personal, non-commercial use, consistent with these Terms, provided that You maintain all copyright and other notices contained in such Content. You may not copy, reproduce, republish, upload, post, transmit, distribute, and/or exploit the Content in any way (including by e-mail or other electronic means) for commercial use without the prior written consent of Us or the Providers. You may request consent by faxing a request to Holoholo Grill at (808) 742-2538. Your modification of the Content, use of the Content on any other Web site or networked computer environment, or use of the Content for any purpose other than personal, non-commercial use, without the prior written consent of Us or the Providers, violates the intellectual property rights and proprietary rights of the Content owners and is prohibited. password upon Your knowledge or belief that such ID, confirmation number, and/or password is, or may be subject to, a breach of confidentiality. We may suspend or terminate Your service or access to this Web Site if We believe a breach of these Terms has occurred. You are specifically prohibited from any use of this Web Site, and You agree not to use or permit others to use this Web Site, for any of the following: (a) take any action that imposes an unreasonable or disproportionately large load on the Web Site’s infrastructure, including but not limited to “spam” or other such unsolicited mass e-mailing techniques; (b) disclose to, or share with, the assigned confirmation numbers and/or passwords with any unauthorized third parties or using the assigned confirmation numbers and/or passwords for any unauthorized purpose; (c) attempt to decipher, decompile, disassemble or reverse engineer any of the software or HTML code comprising or in any way making up a part of this Web Site; (d) upload, post, emailing or otherwise transmitting any Information, Content, or proprietary rights that You do not have a right to transmit under any law or under contractual or fiduciary relationships; (e) violating any applicable local, state, national or international law, including, but not limited to, any regulations having the force of law; and, (f) using any robot, spider, intelligent agent, other automatic device, or manual process to search, monitor or copy Our Web pages, or the Content without Our prior written permission, provided that generally available third party Web browser such as Netscape Navigator and Microsoft Internet Explorer may be used without such permission. This Web Site may contain links to third-party Web sites not under Our control or operation (the “Linked Sites”). The links will let You leave this Web Site, and You access them at Your own risk. You acknowledge that We provide the Linked Sites for Your convenience and information only. We do not endorse nor are We responsible for any content, information, or other related materials found at any such Linked Sites or any links contained within such Linked Sites, whether or not We are affiliated with the owners of such Linked Sites. You may not establish a hyperlink to this Web Site or provide any links that state or imply any sponsorship or endorsement of Your Web site by Us or the Providers. We operate this Web Site (excluding Linked Sites) from Our offices within the States of Hawaii and California. It can be accessed from all 50 states, as well as from other countries around the world. As each of these places has laws that may differ from those of Hawaii and California, by accessing this Web Site, You agree that these Terms and Your use of the Web Site shall be governed in all respect by the internal substantive laws of the State of Hawaii, without regard to conflict of laws provisions and shall not be governed by the United Nations Convention on the International Sale of Goods. You further submit to exclusive jurisdiction and venue in the state and federal courts located in the State of Hawaii for all disputes, cases and controversies regarding this Web Site, Your use of this Web Site, and Your relationship with Us. We make no representation that materials on this Web Site are appropriate or available for use in other locations, and accessing them from territories where the Content is illegal is prohibited. Those who choose to access this Web Site from other locations do so at their own risk and are responsible for compliance with local laws, including laws regarding the transmission of technical data exported from the United States or the country in which You reside. You are responsible for any information, text, images, videos or other materials or content that you post on a Site or transmit through our Sites (“User Content”). You agree, represent and warrant that any User Content you post on a Site or transmit through our Sites is truthful, accurate, not misleading and offered in good faith and that you have the right to transmit such User Content. You shall not upload, post or otherwise make available on or through a Site any User Content protected by copyright, trademark or other proprietary rights of any third party without the express written permission of the owner of such right(s). You shall be solely liable for any damages resulting from any infringement of copyright, trademark, proprietary rights, or any other harm resulting from such User Content. By submitting User Content to us directly or indirectly (including through the use of hashtags on third party social media platforms), you grant to us (or warrant that the owner of such information and material has expressly granted to us) a royalty-free, perpetual, sublicensable, irrevocable, and unrestricted right and license: (a) to use, reproduce, display, modify, adapt, publish, perform, translate, transmit and distribute or otherwise make available to others such User Content (in whole or in part and for any purpose) worldwide; (b) to incorporate such User Content in other works in any form, media, product, service or technology now known or hereafter developed for any purpose, including sale, manufacture or advertising (and to exercise all intellectual property rights associated with such products or other works); and (c) to use your name, screen name, location, photograph, avatar, image, voice, likeness and biographical information provided in connection with the User Content in any and all media and for advertising or promotional purposes. You also hereby grant each user of the Sites a non-exclusive license to access your User Content through a Site, and to tag, rate, review, comment on, use, reproduce, distribute, display and perform such User Content as permitted through the functionality of a Site and under this Agreement. Additionally, you irrevocably waive any “moral rights” or other rights with respect to attribution of authorship or integrity of your User Content that you may have under any applicable law or legal theory. Notwithstanding the foregoing, please note that any personally identifiable information you submit to us through our “Contact Us” forms, product order pages, job application portals or other forms that are intended to be confidential will be handled in accordance with our Privacy Statement and will not be publicly disclosed, except as described in our Privacy Statement or otherwise approved by you. You and We are dealing at arms’ length, creating a commercial relationship. We are not Your Agent or Your fiduciary. All of Our hotel chain’s hotels and facilities are independently owned and operated by independent franchisees and licensees. They manage and operate the facilities, and they are the employers of all employees and contractors who work at the facilities. These franchisees are independent contractors, and no agency, partnership, joint venture, employee-employer or franchiser-franchisee relationship is intended or created by these Terms. An ever-expanding family of restaurants around the world have emerged. Choy continues to grow his talented team of executive chefs for restaurants located in Tokyo, Guam, Seattle and the newest addition, the Holoholo Grill, Koloa Landing Resort in Kauai. After handpicking each chef, Choy collaborates to develop a diverse menu for each restaurant. The result culminates in many of Chef Choy’s favorites, including the braised short ribs, Sam’s signature poke and island fish stew, and a signature Koloa sugar lava spice rub for meats, found only at Holoholo Grill. With eleven top-selling cookbooks and frequent appearances on hit Food Network programs including Extreme Cuisine, Emeril Live!, East Meets West with Ming Tsai, Sarah Moulton’s Cooking Live, Iron Chef America, Luau Challenge and Dinner Impossible. Choy is a four-time nominee for the James Beard Best Pacific Regional chef award and the recipient of the James Beard/Gallo of Sonoma American Classics Award. At the Holoholo Grill you will experience the sensational aromas and savory flavors of Chef Choy’s island style cooking and innovative recipes known throughout the world, earning him the title of Hawaii’s culinary ambassador. With 20 years of culinary experience and proven leadership, Executive Chef Shaun Hinson hails from a long line of exclusive eateries, including The Ford Plantation, Sea Pines Country Club and most recently the Bohemian Hotel Savannah Riverfront. In collaboration with Chef Sam Choy, Hinson developed the diverse menu at Holoholo Grill, which consists of many local favorites. While working in the South, he mastered meat smoking methods and brings a Koloa spin to things with ingredients from Kauai. 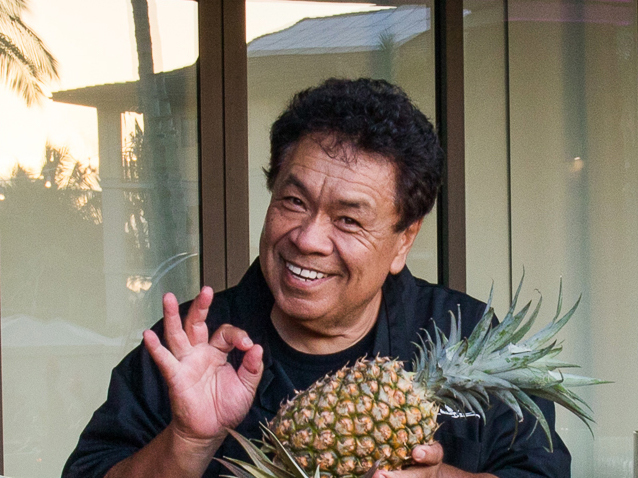 At Koloa Landing Resort, Hinson manages all aspects of food and beverage, develops the menu and collaborates with Choy on local and regional recipes. Hinson familiarized himself with luxury style hotels while working as the executive chef at the Bohemian Hotel Savannah Riverfront, Autograph Collection in Georgia since 2016. While there he maintained the four-diamond status. *Consuming raw or undercooked meats, poultry, seafood, shellﬁsh, or eggs may increase your risk of foodborne illness, especially if you have certain medical conditions.